It all started with a sail down the Nile in a felucca. That’s where an Egyptian named Refat took a fancy to me. In short order he invited me and my friends to his place across the river from Luxor. It turned out to be a feast, with colorful salads, unusual grains and a spectacular platter of roast pigeon in the center of the table. Succulent, juicy, lightly spiced, this was a dish to remember. So when I returned to Paris, I tried it out. Pigeons have been raised for centuries in France, where they are considered a delicacy. In the countryside, you will see the occasional picturesque dovecote, built during the Middle Ages by the nobility for raising the birds. And of course, before they were raised, pigeons/doves were plentiful in the woods, where they were hunted. One can imagine that they have been relished here since ancient times — as they were in Egypt and other parts of the Middle East. The Bible notably mentions pigeons as a food raised by the Hebrews. 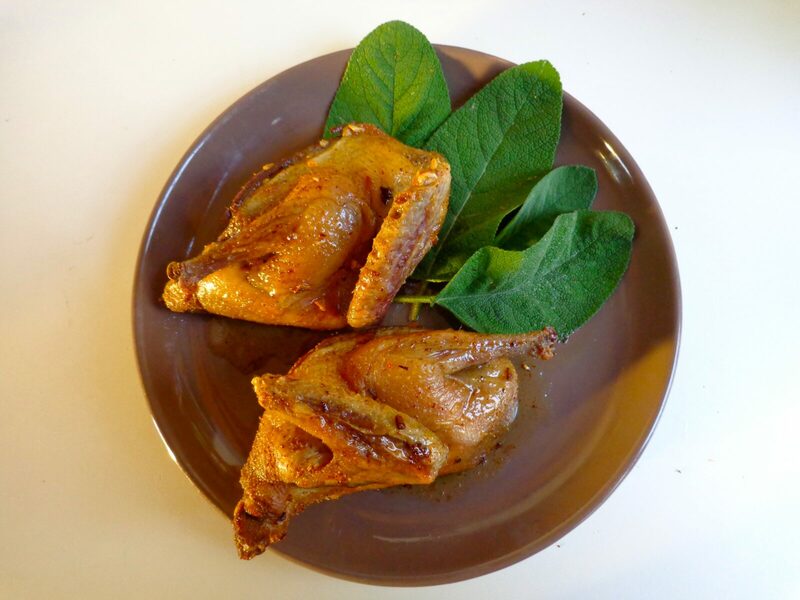 These days in France, raised pigeons are readily available year round at quality butchers and at farmers’ markets. Here they are often roasted or stewed in a large pot on the stove, and may be accompanied by bacon, mushrooms, garlic, cabbage, or even stuffed with foie gras. I prefer the simpler, Egyptian method of roasting the pigeons in the oven. They are first bathed in a marinade of olive oil, cumin, garlic and black pepper, then roasted at high heat until medium rare. The Egyptians often stuff the pigeons with rice, but again I prefer the simpler way of roasting the birds with no stuffing. I serve them alongside interesting vegetables, salads or wild rice. This makes a lovely dinner for hot summer nights. The recipe is very quick and it allows you to place something special on your table with a minimum of fuss. Raised pigeons (often called squab) are available these days in many places, although in some countries you may need to mail order them. If you cannot find pigeon, you may substitute a different small bird. Whatever you choose, be sure to select an appropriately wonderful red wine. During the summer, The Everyday French Chef will appear every two weeks instead of weekly. See you next on Friday, June 26. This entry was posted in 6. 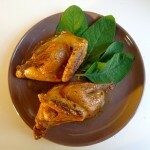 Poultry and tagged Egypt, France, pigeon, recette, recipe. Bookmark the permalink.